The prints depicted here formed the basis for this book: Martin Jürgens. The Digital Print. Los Angeles: Getty Conservation Institute, 2009. (British edition: London: Thames and Hudson, 2009). A number of the eyes depicted on this website are taken from the prints in the Mellon Digital Sample Set, which was produced by the American Institute for Conservation of Historic and Artistic Works (AIC). The online resource Graphics Atlas (hosted by the Image Permanence Institute) is a portal for the examination and characterization of a large number of printing processes, including digital prints. Among other things, typical cross-sections of the prints depicted on the-eye.nl can be found there. 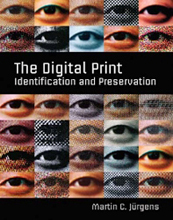 A very helpful website on the preservation of digital prints is the Digital Print Preservation Portal (DP3, also hosted by the Image Permanence Institute). 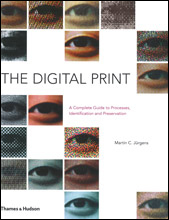 This website offers advice on a large range of topics and is updated often with new research results on the deterioration of digital prints. By providing links to other sites, www.the-eye.nl does not guarantee, approve, or endorse the information or products available on those sites.